The Benefits and Drawbacks of Doing a Dreamfeed. 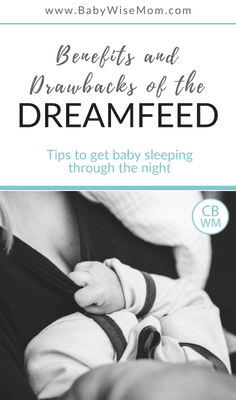 This post discusses the good things about doing a dreamfeed for longer night sleep from baby as well as the drawbacks of doing a dreamfeed. The Dreamfeed is a powerful tool to help your baby sleep a longer stretch through your night sleep. This allows baby to get the feedings she needs while allowing you the longest stretch of uninterrupted sleep possible. Sleep has many powerful, known benefits. Sleep helps you heal (a benefit after delivering a baby) and helps you think through things better (a benefit for a mother caring for children). Helping your baby sleep well through the night helps your baby, but it also helps you as the mother, which in turn, helps your baby. The Dreamfeed can be a handy tool. Sometimes it works beautifully and sometimes it is a big flop. 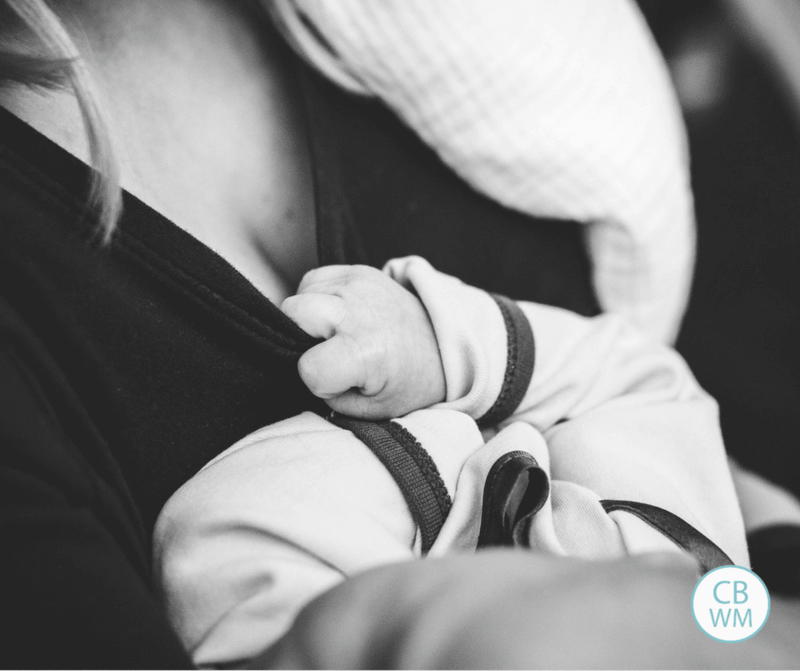 Here are some tips, comments, and advice from Babywise moms on the topic of the Dreamfeed. In making these comments, moms were pondering if they would use the dreamfeed for their next child. You will notice not every mom loved the Dreamfeed. For some, it worked great for one child and not well for a different child. Some fully disliked it. Most, however, really loved the Dreamfeed and found great benefit from using it. Read more about the Dreamfeed here. first! It was sweet bonding for him. She dropped it around 6 months with no problem at all. the feedings, and that was when I started the dream fed. It worked REALLY well! started it at 7 weeks old and he no longer needed it by 11 weeks. Rebecca said: I thought it worked great. thing I didn’t like, was having to do one more thing before I went to bed. definitely try this technique with our second. from 6-9 months. It helped me get uninterrupted sleep which was so important! schedule so much easier! I tell everyone about it! step before he started sleeping through the night. another middle of the feed. Totally trying it again with baby number two. the dream feed, so it gave him some bonding time with the boys. waking up several times a night. times and plan on it again with #4. Katy said: Used with all 3 my girls. It seemed to serve a good purpose and I enjoyed the quiet time together. Amy said: Loved the dream feed!! Anita said: Loved it. Used it with both my girls. Autumn said: Yes! Loved it! If you need help getting your baby to sleep through the night, see What to Do When Your Baby Is Not Sleeping Through the Night. just weird though and I will absolutely try it with any future children. to reduce it we start getting night wakes. I am so over it! at night….so I guess I can’t complain! kids, but I had a daughter who it created nighttime problems with. daughter it backfired on me! Dana said: I did the dreamfeed with my first three and it worked great. eat, then sleeps until 7. Works much better for this one. I quit. They both quit eating entirely and doing the full 12 hours by 5 months. longest so interfering with that didn’t benefit anything. when we did they slept longer stretches. any of my three babies. Always tried to keep “begin as you mean to go” in mind. to be woken up ourselves once we’re in a nice and peaceful deep sleep. until 5 when I didn’t 🤷🏽‍♀️ So hard to say! it was so much better to just let him sleep! and momma went to sleep around 9 pm too! otherwise we love the babywise schedule. always woke up, so we never did it. The Dreamfeed, or late evening feeding, does not always work perfectly. For some babies or some moms, it just doesn’t make sense. For most, however, it helps everyone get better sleep at night. My recommendation is to give it a try and see if it helps sleep for you and your baby. If not, move on. If so, happy sleeping. Read more about the dreamfeed in Secrets of the Baby Whisperer (affiliate link).